We are at the cutting edge of oesophageal cancer treatment. The team approach from our expert doctors and nurses ensures that you receive the most up-to-date and comprehensive treatment, personalised to your situation. Mr Alkhaffaf and his team will take the time to answer all your questions and help you make the right decisions about your care. The oesophagus (also known as the food-pipe or gullet) is a muscular tube which carries food from your throat to the stomach in your abdomen. This is a potentially life-threatening abnormal growth which occurs in the oesophagus. It usually starts from the inner lining of the oesophagus and is commonly one of two types; ‘adenocarcinoma’ or ‘squamous cell carcinoma’. Most oesophageal cancers occur in the lower portion next to the opening of the stomach. Oesophageal cancer is far more common than it once was. The rate at which it is being diagnosed is increasing faster than any other cancer in the UK. It affects men more than women and is more common as we get older. Approximately 9,000 new cases are diagnosed every year in the UK. Unfortunately, many of the early signs of oesophageal cancer are non-specific and can be experienced with many simple illnesses and conditions. As a consequence it is often the case that by the time oesophageal cancer is diagnosed, it is no longer in its early stages. The prognosis of oesophageal cancer depends on many factors, the most important being how advanced the tumour is when it is diagnosed (tumour stage). The earlier the diagnosis is made, the better the prognosis. Mr Alkhaffaf will talk to you about these factors in detail and will ensure that you are given the correct information specific to your particular situation. 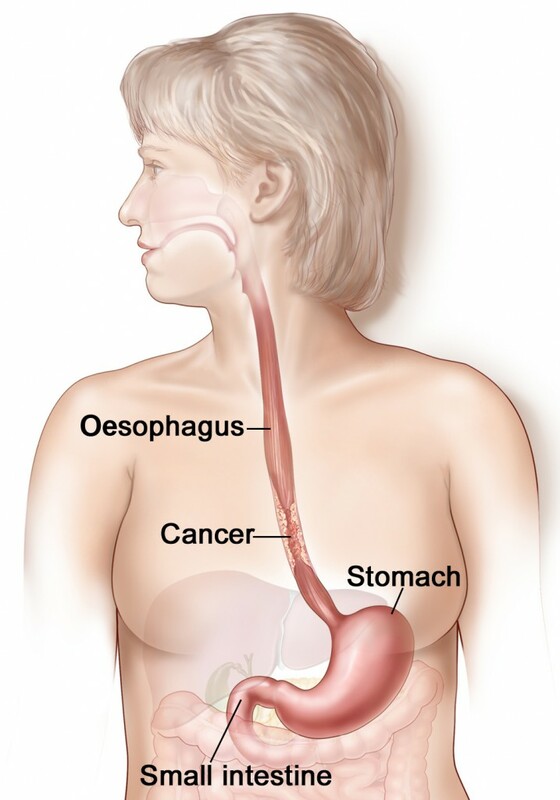 The treatment of oesophageal cancer depends of many factors such as the type of cancer, how early the cancer is (stage of cancer) and finally your general health and fitness. More often than not, treatment which is given with the intention of curing oesophageal cancer involves a combination of chemotherapy followed by surgery, however other options exist. At My Surgical Specialist, Mr Alkhaffaf will talk to you about the right treatment for you. He will walk you through the entire process so that you can make the right decisions about your treatment. Mr Alkhaffaf is at hand to offer help and advice regarding your condition. Contact us now to organise a private consultation. Q: What is the Oesophagus? Q: What is Oesophageal Cancer? Q: How Common is Oesophageal Cancer? Q: What Causes a Oesophageal Cancer? Q: How is Oesophageal Cancer Treated? The treatment of oesophageal cancer depends of many factors such as the type of cancer, how early the cancer is (stage of cancer) and finally your general health and fitness. More often than not, treatment which is given with the intention of curing oesophageal cancer involves a combination of chemotherapy and surgery, however other options exist. Mr Alkhaffaf will talk to you about the right treatment for you. He will walk you through the entire process so that you can make the right decisions about your treatment.